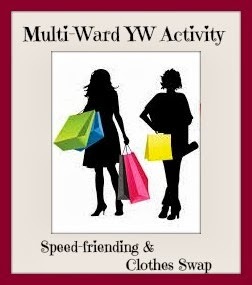 When I contacted the neighboring ward’s YW President to see if we could schedule a joint (all-girls) activity with both ward’s YW, I suggested the speed-friending concept and she came up with the idea for the clothes swap. This time, since we had a larger group of girls, we didn’t include the leaders in the speed-friending (except for one who filled in when there was an uneven number – we had some girls trickle in throughout the evening, so we were constantly adjusting the number of chairs, etc). This part of the activity took about 45 minutes. It could be shorter or longer, depending on how many questions you have prepared and how many girls you have (we had about 26 girls). During the speed-friending, the other leaders were setting up a clothes-swap in the RS room. We had asked the yw (from both wards) to bring any unwanted (but CLEAN) clothes, shoes, or accessories to donate for the swap (and to get their parent’s permission first before donating anything!). We had about 26 girls attend, and I’d estimate we had about 300 swap items donated. We quickly arranged the clothes into areas (pants, skirts/dresses, shoes, shirts, etc) while they speed-friended. After the girls finished up the speed-friending, they went into the RS room, where they were welcome to take anything that they wanted from the donated items. We did not place any restrictions on who could take what (ie, you didn’t have to bring something to take something). Most girls took away at least a few things. Some girls had to haul their ‘new’ clothes away in garbage bags. Any leftover items were donated to a thrift store. Afterward, we had doughnuts and milk for refreshments. This was one of our most popular activities EVER – the girls have been asking when we can do it again! This could also be done on a Stake level. COST: Only the cost of refreshments!